Even though these stocks have performed poorly, a couple may be worth a look. Over the past year, the S&P 500 has done reasonably well, up about 8.5%. However, not all stocks have delivered solid performance. In fact, there are more than 100 stocks with market capitalizations of $250 million or more than have been cut in half (or worse) over the past 12 months. 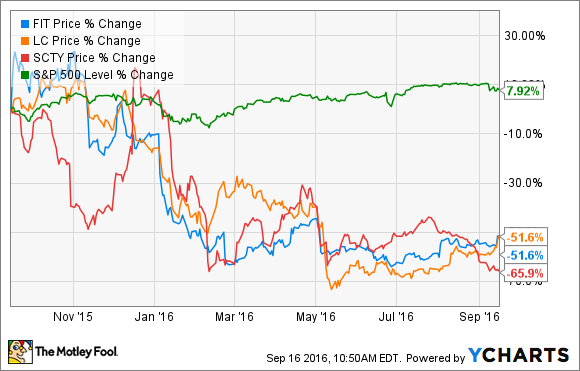 Here are three popular stocks that fall into this category, and why they are -- or aren't -- worth a look. SolarCity (NASDAQ:SCTY.DL), along with pretty much every other solar stock, has had a pretty rough year. Growth has failed to impress analysts, and the company's full-year guidance for installations was reduced by about 10% in the latest earnings release. Plus, the company's merger agreement with Tesla Motors (NASDAQ:TSLA) turned out to be less favorable than originally announced -- an exchange rate of 0.11 shares of Tesla versus a range of 0.122 to 0.133 that Tesla originally offered. One possible reason SolarCity deserves a look is that it could be a cheaper way of getting into Tesla. If the merger is approved, SolarCity shareholders will receive 0.11 shares of Tesla for each of their SolarCity shares. At the current share price of $17.10, this implies a cost of just $155.45 per Tesla share that you would eventually receive -- a 22% discount to Tesla's $200 share price as I write this. Of course, there are reasons for this. Tesla could decide to back out of the deal, or the company's shareholders could reject it outright. Since most analysts have a generally negative view of the proposed merger, it's not inconceivable for this to happen -- in fact, I'd say there's a pretty good chance. However, keep in mind that SolarCity was actually trading higher before the merger announcement. So, if you do buy SolarCity, be sure that you're fine with owning either company -- but if you have a positive outlook on both, this is a pretty interesting pricing situation. As I write this, Lending Club (NYSE:LC) is down by 54%, but it was in much worse shape just a few months ago, bottoming out at below $3.50 per share (it's currently around $6.35). The cause of the drop was a scandal that revealed that details on a group of loans had been altered for an investor, along with failure to disclose a certain conflict of interest. While there are still many questions about the long-term sustainability of online lenders such as Lending Club, things are starting to improve in regards to shareholder trust. And, although the company reported a wider-than-expected loss during the second quarter, Lending Club also originated 2.3% more loans and added a couple of new board members. The fire sale prices earlier this year may have been a bit of an overreaction, but I don't see the volatility in Lending Club subsiding anytime soon. FitBit (NYSE:FIT) has shed more than half of its value over the past year, mainly on fears of slowing growth, increasing competition, and higher costs. Despite the fact that growth has definitely slowed, the company is still projected to grow its revenue by 35-40% this year -- pretty impressive for an already-profitable company. Recent new products, such as the Alta and the Blaze, have been successful, and as my colleague Rick Munarriz recently discussed, the newly unveiled Charge 2 and Flex 2 could provide a jolt to FitBit's sales during the important holiday season. Despite the decline in price, FitBit is still the dominant player in its industry, and while nobody can predict how well the new devices will sell, I'm optimistic that FitBit will benefit from its huge existing customer base, many of whom may choose to upgrade their devices. Are any of the three worth buying? It depends on your personal investment objectives, and specifically your risk tolerance. None of these could be called a "low-risk" stock, by any definition of the term. Personally, I bought shares of FitBit in recent months, and I'm considering picking up some SolarCity because I like the company's long-term prospects, and for the added bonus of being able to acquire Tesla shares cheaply. I wouldn't touch Lending Club at this point, as I'm not convinced the reward potential outweighs the high level of risk.